Viber 2.0 is finally available for download in the App Store. This new update brings many new and interesting features including free instant messages. When you use Viber, the quality of the sound is very clear from the regular calls. You can call anyone and anywhere in the world for free. 1. Viber now has free text messaging! Send and receive free text messages to and from all your Viber contacts. We’ve added a new tab called Messages. To send a text, simply select a contact from your list, and start texting for free. 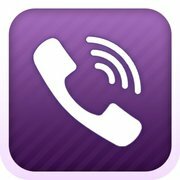 ● New “Free Text Message” button added to Viber contact details. Tap this button to send this user a free message. ● Viber will also notify you about incoming messages so you won’t miss a word single text. To view your ‘Favorites’ – go to the contacts tab, and tap the Favorites button at the top. Now, you’ll always know the status of your outgoing calls. Once a call is placed, a “Calling” state will indicate that Viber is now connecting to the other party. Once a connection is established, a “Ringing” state will indicate that the other party’s Viber, is now actually ringing (note that a call can still be established even if you don’t see the “Ringing” state). A “Don’t show again” option was added for to the “Place a regular carrier call” inform dialog. A new option provides the ability to deactivate your Viber account, so that you can easily reactivate Viber with a new phone number. Find this option under the ‘More’ menu. 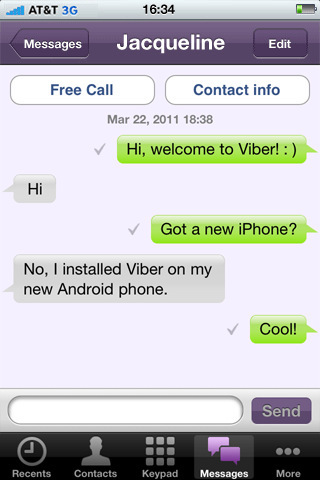 Android version of Viber will be released soon that will allow us then to communicate for free with many other friends.